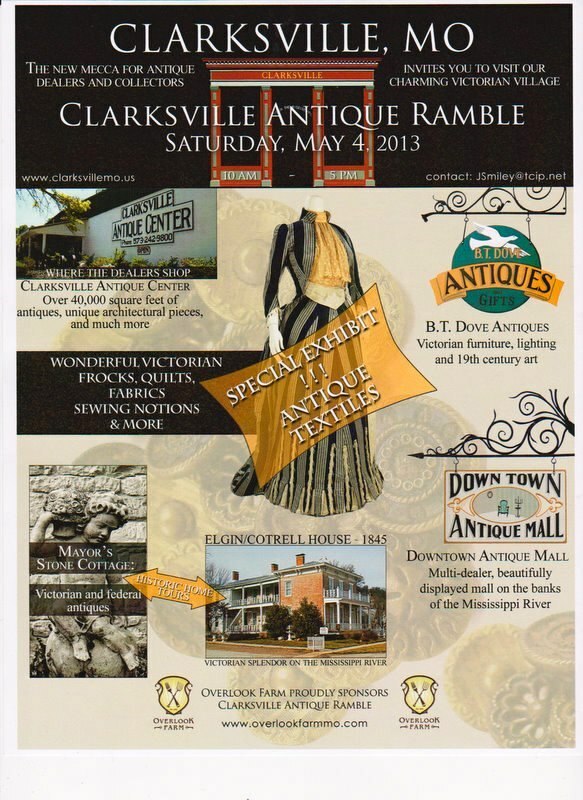 Antique Ramble is Still On. A while back I did a post about an event we are having here in my little home town of Clarksville,Mo. It is an Antique Ramble. The antique shops are open and having specials. The Mayors Stone Cottage and My Old Historic House are both open for tours. We have been going through a flood, but the river has settled down and we are going ahead as planned with the Ramble, this Saturday May 4th. 10:00 to 5:00 Some of the roads are still flooded but there is clearly marked detours. The country side is beautiful as it come alive with spring. Red buds are blooming. The house tours are $5.00 each and you can pay at either house. Go to one or both.No appointments needed. Just show up.The Mayors Stone Cottage is a little gem, done to the early American period with fine antiques, paintings and accessories. My Old House is 1845 Ante Bellum and also done to the period. It sets right on the river banks and I am sure there will be a sand bag or two setting around. There will be a visitors tent at the 4 way stop. There will be maps of the shops and tour houses there. Park on the highway and walk. Every thing is in a few blocks. The Station will be open with Farm to Table Food. It is a world class place to eat, beautiful and what wonderful food. Come make a day trip and enjoy our little town and see what it is like to live on the Mighty Mississippi. We are a little messed up with a lot of sand bags, but the beauty of Clarksville and what it has to offer is still out front.I'll be at My Old Historic House, giving tours. My little Antique Mall, downtown, 2 blocks away, will be open and we are well stocked with lots of garden and spring items. Please try and come. Say hello and meet Ms. Sissy Dog. she'll be glad you came. This is a view out our window today as we camp in the shop window. Looks a little like a war zone. This is how it looked the first day, nice and neat, then all hell broke loose. Thanks to all the wonderful bloggers that have commented and sent there ,love because of the flood that I am going through right now. It was almost a flash flood. They told us last Wednesday morning the river was going to be 10 feet over flood stage in 3 days. The entire main street, including my Historic Home and Antique Mall are right on the river. It was a scramble. We had to put up flood walls, move out, and up, and sand bag an entire town. It is amazing how people come from everywhere to help. It was like a fast moving motion picture to watch the sand bags fill and the walls appeared from out of no where. It makes you believe in man kind. It is kind of hard to do that these days with all the bad that goes on in the world. School shootings, stabbings, attacks and on and on. We still live in one of the greatest countries in the world. It sure was proved to me the past few days. Our Governor sent the national guard and they have worked endless, They were the best and just took control. There was also an amazing group of young people. Women and men. They looked like teenagers. They were sent by Americore. They were the brains behind the whole thing. They have worked day and night, going with out sleep or showers. In water, on machinery and what ever else was needed. It was a blessing we had them. I just can not believe such young people could do so much. They get very little pay. Sleep on the floor and works hours with no rest. The locals here in my town came together and opened a soup kitchen. It was in a church basement right here in down town Clarksville. People have carried in the most amazing food from fired fish, chicken, home made pies, cakes and cookies. The workers have been so spoiled they will never want to leave.When I am not working on sand bags I like to go to the soup kitchen and help out. It is a lot more fun. I made chicken pot pie, pea salad, breakfast eggs and fried apples. Tomorrow I am making bread pudding. Today some of the workers were leaving us and they all gave us hugs and some of us actually cried. The flood is far from over. There could be a surge any day. There is usually at least 3 crest. We have only had the first.There is lost of snow up north that still has to melt. We are in this for awhile yet. In the mean time, I have lost a hot water heater. My basement will have to be professionally cleaned so it will not mold. I have lost a large section of side walk. Some of my iron fence was destroyed. They yard is trashes as well as my gravel parking lot. The shop will be closed for at least a month and perhaps more. It is hard to think about as it and my Social Security are my only income.I know some how the Lord will provide and for now I am not going to worry about it.I know the money will come from somewhere just like all these workers came. I am glad I had this time to unwind and tell some of my story. This is the second flood I've gone through. The first was in 08, just 2 years after I bought the house. I have to say this one was a lot less stressful., being 5 years older did not actually help. It might be time to think about moving on. If you have read my blog ,you know I have this old beautiful home. I love it very much. But, when it starts to take your life, it might be time to think of other options. I know I have made some typos, and I am sorry, but with what I have been through. You figure it out. Sissy and I love you all and love hearing from you. When this is all over and the sand bags come down, we would love to have you come for a visit. God bless you all. This is the riverfront only a few feet outside my shop. The river had not even reached the park at this point. Sissy has gone to bed. She is wore out and mixed up. Our lives have been turned inside out for the past few days.